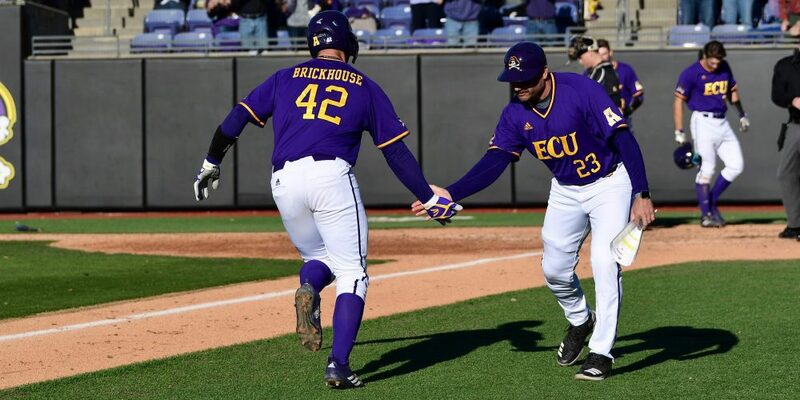 GREENVILLE, N.C. — The first month was a bit uneven for East Carolina, a very talented and experienced team that carried a No. 11 national ranking into the season. The Pirates weren’t bad — they still haven’t had a losing weekend, but they were a rather modest 8-5 after 13 games. Nagging injuries to each of ECU’s Big Three lineup linchpins — Bryant Packard, Spencer Brickhouse and Alec Burleson — played a significant role in the offense being just a bit out of sorts in the early going. Now, those three dangerous lefthanded hitters are all healthy and heating up — and accordingly, so are the Pirates. ECU has won 9 of its last 10 since that 8-5 start, and it has opened American Athletic Conference play this weekend with a quality series win over a projected regionals team, UCF. The Pirates clinched that series with a 7-4 win Saturday and will go for the sweep on Sunday.